We deliver to your home or office, anywhere within New Zealand. Products are delivered from your nearest Harvey Norman store. Delivery times vary depending on the weight and size of the item and also the distance between the nominated shipping address and your closest Harvey Norman store. Delivery of some furniture and bedding items may take up to 8 - 10 weeks due to availability and manufacturing. Your local Furniture and Bedding store will contact you within 24 hours of receiving your order to advise expected delivery dates and arrange a suitable time to deliver your items. We disclose our delivery fee upfront, so you know exactly how much your total order will cost. You can work out delivery costs for your purchase using the delivery cost calculator in the Shopping Cart. Otherwise, delivery charges will be automatically calculated in the Checkout process and displayed as a line item in your costs. The delivery fee is calculated by the size and weight of the items, plus the delivery location. If you have any special delivery instructions, please detail in the notes section of your order or contact us with your specific requirements. Any additional requirements may incurr additional charges. Please note, delivery does not include installation of your products. See our installation section for the installation services we provide. If your order contains both small and large items, you will be charged one freight amount based on the largest item ordered. All order deliveries require a signature. We will attempt to deliver your item 3 times in order to obtain a signature before returning the item back to the originating store. Items will not be left unsecured at a private or commercial premises under any circumstances. If the delivery courier is unable to obtain a signature, a calling card will be left with details as to how you may arrange a pick up or re-delivery of your order. When we have shipped your order, you will receive an email notifying you of the shipping reference number and an estimate of the number of days in which your order will arrive. Once you have received your shipping reference, you can track and trace your item here. 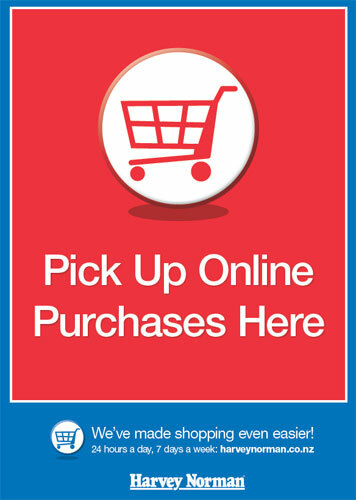 When buying online, you also have the option to pick up your order from your nearest Harvey Norman store free of delivery charges. Simply select the Pick Up In-Store option and nominate your preferred location. When you visit the store - look out for our signage pointing you to where you can pick up your order. Items will be ready for collection 4 business hours after you place your order. For other frequently asked questions about Pick up's or Deliveries - check out our FAQ's page.